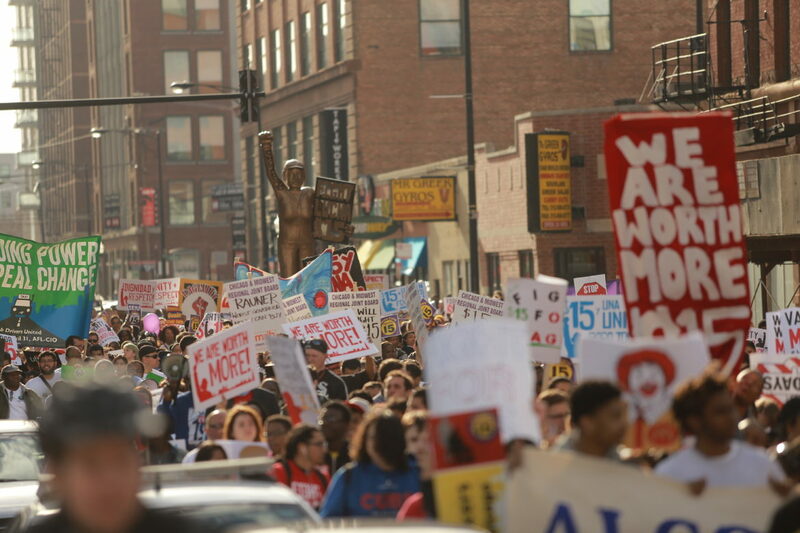 Chicagoans march in support of a $15 per hour living wage. When Chicago’s minimum wage jumps to $10 per hour on July 1, many Chicago workers still won’t be earning enough to live on. It takes more than twice that, $22.78 per hour, for a single parent with one child to meet their basic budget needs in the Chicago metropolitan area, according to the Living Wage Calculator, a project of the Department of Urban Studies and Planning at the Massachusetts Institute of Technology. The tool, created by professor Amy K. Glasmeier, has been around 11 years, but it has attracted more attention in recent years as activists around the country push for higher wages for low-income workers. Last summer, Swedish furniture giant IKEA announced that it would use the living wage calculator to set minimum wages for workers at its 41 retail stores in the U.S. The living-wage calculation is based on the average cost of a range of household expenses on a tight budget, including food, child care, medical expenses, housing, transportation and taxes, adjusted for geographic location and for families of different sizes. The calculator was updated in April to reflect 2014 living costs. A single parent with three children in the Chicago metro area would need to make $33.69 per hour, more than three times the new city minimum wage, to meet the family’s basic needs. Even for a single adult with no children, the new Chicago minimum wage is 11 percent lower than the living wage, which is $11.14. The only type of family in Chicago for whom the new minimum wage is sufficient to meet basic needs is a household with two working adults with no children. Those adults would need to make $8.51 per hour each, according to the calculator, to meet a basic budget. There is consensus among lawmakers and voters on raising the statewide minimum wage in Illinois, which is currently $8.25 per hour — not enough to meet a basic budget for any family, according to the calculator. But there is little agreement on how high or how quickly to raise it. About two-thirds of Illinois voters approved of raising the minimum wage to $10 per hour on Jan. 1, 2016, in a non-binding ballot referendum in November. In his State of the State address in February, Gov. Bruce Rauner expressed support for raising the state minimum wage to $10 per hour by 2022. Democrats in the state Senate passed a bill that would raise the minimum wage to $11 by 2019. Child care is the most expensive element of a family’s budget, according to the calculator, which compiled child-care data from the National Association of Child Care Resource and Referral Agencies. Child care for two children costs $11,658 per year in the Chicago area, more than the cost of housing for a family of three. The calculator makes a few assumptions, some of which could inflate the cost of living estimate used to calculate the living wage. For example, it assumes no deductions on taxes, even though the federal government provides incentives, like deductions for married couples and the Earned Income Tax Credit, that help families make ends meet. However, other assumptions could have the opposite effect. For example, the calculator assumes, for the sake of simplicity, that a family with two children has one 4-year-old and one 9-year-old. Families with younger kids or children who are closer together could pay more than the calculator’s estimate for child care. The tool also bases housing costs on the U.S. Department of Housing and Urban Development’s Fair Market Rent estimate for Cook County, which could underestimate the cost of housing for families living in Chicago neighborhoods where rents are higher than they are in the suburbs. Of the country’s 10 most populous metropolitan areas, Chicago, which is third in population, is seventh in cost of living. The living wage for a single parent of two children in Washington D.C., the most expensive metropolitan area, is 40 percent higher than the wage for that same parent in Chicago. Washington’s minimum wage is scheduled to increase to $10.50 per hour on July 1, the same day that Chicago’s will rise to $10 from the current $8.25 minimum wage. Los Angeles, the fourth-most-expensive metropolitan area, according to the calculator, recently made headlines when the City Council voted to increase the city’s minimum wage to $15 per hour by 2020. The first increase, to $10.50 from the current state minimum wage of $9, won’t go into effect until July 2016. By then, Chicago’s minimum wage will have increased to $10.50, on its way to $13 per hour by July 2019. But minimum-wage workers in both cities will still be making far less than a living wage. Notes: Minimum wages are as of July 1, 2015. Several cities, including New York, Washington D.C., Los Angeles and Chicago have proposed or passed ordinances that would raise the minimum wage above the listed level, but those increases, if enacted, would take place after July 1. The minimum wage in Georgia is technically $5.15 per hour, but it is superseded by the federal minimum wage, which is $7.25 per hour. The governor’s budget defunds youth programs in neighborhoods most affected by violence. Raising the minimum wage isn’t the answer. Make it easier for the employees to join or form a union. Let the wages be determined by honest and open negotiations instead of determined by the government. More government control and regulations doesn’t work. Instead, let the workers to form or join a union to represent them. Let the wages be determined by honest and open negotiations instead of determined by the government. Less government control and regulation is better. Let the free market determined wages. Minimum wage isn’t intended as a way to support your entire family. If you increase it to $10, they want 15, increase it again to 15, they want 20 while the rest of the employment chain stays relatively the same. In a free market, min wage should be set at whatever rate it takes to attract somebody to do that job. What used to be a wage for high school kids making extra money flipping burgers has become a single mom with kids wage. A lot of businesses will streamline the # of employees to make up the difference. More $$ per hour, fewer workers, more automation The real problem is there are no low skill, hard work, good pay jobs out there anymore. While the white collar jobs are paying decent wages, we need blue collar, low skill jobs that pay a decent amount. That will help much more than increasing min wage for no reason. DO YOU NEED A LOAN!!! affordable and his loan process is very fast as well..